Sonoma Hills Retirement Community offers residents 80 garden-style, single-level apartments with a resort-style ambiance. Our studio, one and two bedroom apartments are spacious and bright offering occupants a full-size kitchen, individual central heating/air conditioning units, stacked washer/dryers, drapes, ceiling fans, and private patios. Sonoma Hills is dedicated to providing our residents with the most comfortable lifestyle. 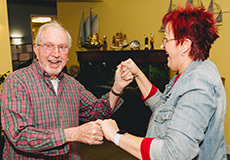 Sonoma Hills Retirement Community provides residents with a gracious and caring staff that is easily accessible 24 hours a day via an Emergency Call System. Every apartment has been equipped with deadbolt locks, fire sprinklers, and smoke detectors. Sonoma Hills reflects the ultimate in comfort and safety. Click here to view a site map of our community. When it is time for our residents to pamper themselves they can stop by our on-site Beauty and Barber Shop, Roberto’s Hair Designs, and let Roberto provide a spectrum of services. Contact our front desk for more details. Our staff here at Sonoma Hills Retirement Community provides transportation services to our residents to allow them the opportunity to safely be transported to their bank, doctors office, grocery store, or other personal chores. Our friendly driver will gladly take our residents where they need to go. As a loyal resident of Sonoma Hills Retirement Community, we thank our residents for their time with us. Each year a resident resides in our community a resident will earn points in our rewards program which will translate into many different benefits. Sonoma Hills Retirement Community is a casually elegant, exclusive independent retirement community in Sonoma, CA. Our one story, 80 apartment complex provides an environment of comfort, safety, fun and peace of mind. Most of our apartments are one-bedroom units; however, we do have a limited number of studio and two bedroom apartments. Our dependable, hard working housekeepers provide weekly housekeeping. Resident laundry rooms are conveniently located throughout the building; however, in-unit washer/dryers are available. Click here to download our most current rates and services informational sheet. Contact us if you have any questions about our rates or services. Thank you!